The Acopian Center for the Environment sponsors a conservation-education competition called ‘Birds in my Backyard’ that encourages school children to build birdfeeders, observe the birds, and take a photo or draw a picture of a bird that comes to the feeder. 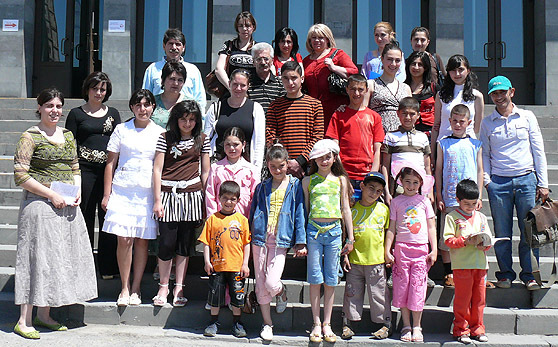 Support this program designed especially for Armenian children. Students can win prizes and participate in the ‘Sun Child Environmental Festival’, another event that the Acopian Center for the Environment actively supports. This festival puts special emphasis on the youth and children’s participation in discussing current environmental challenges in the region. Besides competitive film screenings and photo exhibitions, hands-on activities such as field trips, tree planting and trash collection take place regularly. "The competition is more than a competition; its aim is education. It offers children the opportunity to look at nature from a different angle. I hope that these children will become students of the American University of Armenia when they grow up and will continue to protect nature." ---- Dr. Jennifer Lyman, Ph D.
Past winners of the ‘Birds in my Backyard’ competition.